Bookmark important events in your life with our easily customizable bookmark templates. Handmade by the creative Sleeklens Creative Team. 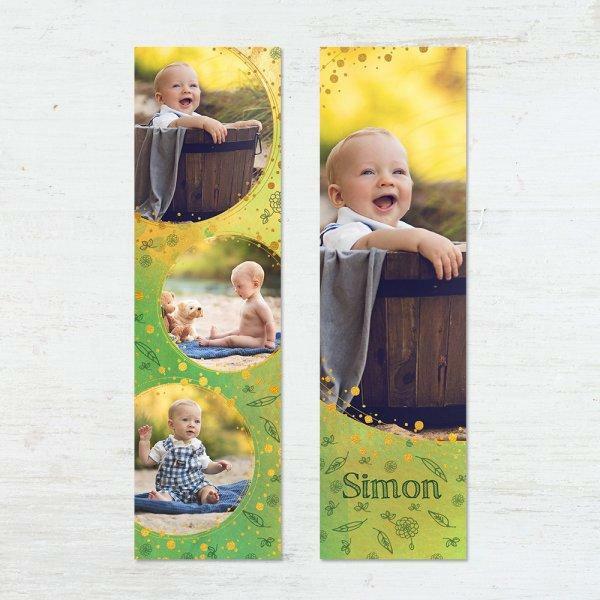 Create a memory for a lifetime thanks to this cute Bookmark Template for Adobe Photoshop. A delicately styled bookmark for use during your nightly reading! Fully editable in Adobe Photoshop. A Spring-inspired Bookmark Template for making your reading sessions a brand new relaxing experience! Looking for an interesting souvernir for your Wedding Day? 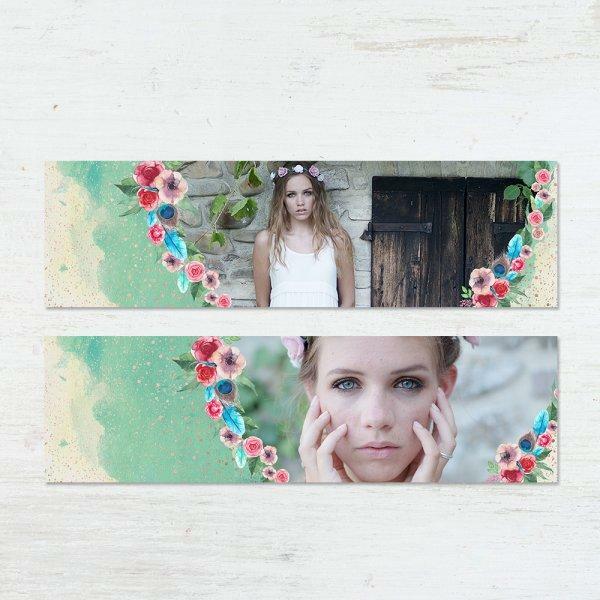 Check this lovely Bookmark Template! If you are one of those people who loves to read books, then you understand the frustration that is likely to set in, when you forget the last page you read, the last time you had the opportunity. With the world becoming fast-paced and responsibilities ever increasing, every book lover will try to grab a page or a chapter on a bus or on the train and by the time you reach your destination, the book will be back in the briefcase or handbag. As such, using a bookmark can be of great help as it makes it easier for you to clearly mark the last page you were in for a continuous read. There is no need to buy multiple bookmarks when you design and produce your own printable bookmarks, while you enjoy adding that personal touch. These amazing templates allow you to simply customize your bookmarks the way you really want them to be, thus putting you in the right mood for the day. In many cases, bookmarks normally come with a certain message that either motivates or inspires you and you can put down whatever you want to write on your bookmarks thanks to the 100% editable template. Why do I need to use Bookmark Templates? For those who reading plays an important role in their daily life, without a doubt you certainly love to enjoy a good long read while sitting on a couch, without distractions around. Unfortunately, in the contemporary world, high demands of work do not allow us such relaxation, so it is necessary to know where you left off in your book. While many enjoy the digital readout in tablets and computers, nothing can compare with the sound of turning pages, or the feeling of paper between your fingers when you turn through the book. Even though it is a popular practice folding the top of any page, such action in an historical or borrowed book would be a sacrilege, so you better use a convenient bookmark to indicate where you paused. With these fully editable PSD files, you can create your own personalized bookmarks - ideal to accompany you in your daily readings or as a nice detail to give a friend. One of the ways to customize your bookmarks using this template is to edit and include a nicely taken and edited photo of your lovely daughter, granddaughter or some gorgeous girl who makes you proud. With our products, you won’t only find easy to place images of your lovely girl, but also put down a message that inspires you. These templates are designed to work with Adobe Photoshop and is compatible with Photoshop CS+, Photoshop CC and Photoshop Elements 6+. Entirely editable to suit your needs and preferences. The advantage of working with templates for Adobe Photoshop is that any work to be done becomes an easy and efficient process. You simply have to select the image that you want to use as part of your template and import it into Adobe Photoshop. With Clipping Mask work mode, all that you need to do is drag the image over as a new layer, position it with the Move Tool or adjust its size, and then apply the Clipping Mask method as shown in our instructions in the FAQ section. But have any other questions, each product brings with it two layers of support: one contains the instructions and another to show the margins of the template to work within before it's time to be printed. Remember to turn them off prior saving your file! Using a template to earmark the last page you read or just help identify something interesting in a given chapter could help save your costly book from common damages. For example, many people will either fold the book pages in half or just fold one of the two corners to help them trace the page they read last. While this might look easy and priceless, the truth of the matter is that it only damages your book and even makes it look untidy. You can, however invest a few dollars for template that gives you the power in your hands to design and print as many bookmarks as possible. Some of the greatest gift ideas show up unexpectedly, and with our wide range of reading helper products you’ll place your mind to rest with some of the best designs available in the market these days. Although the files are pre-designed and ready for installation to your computer or laptop, it is always easy to customize them according to your individual needs; or, even more, ask for a custom service for our designers – we’re always glad to help. A good variety of soothing colors to pick and craft to match your personal style, while at the same time you encourage your loved ones to keep up with such a healthy and fulfilling habit as reading can be. Which is their average size? This selection of templates has a dimension of 5×17 cm – perfect to carry around during a busy urban day or just to let them on your nightstand for that much deserved relaxation time after a stressful work day. Need a bigger sized file? No problem! You can fully edit the canvas size to match your personal needs without losing quality in the process. Our templates are generally Layered Photoshop (PSD) files, 300 dpi. If you are new to these terminologies, it means that you can work with the individual image layers even after you have already saved the file. In addition, the PSD files are designed to give a unique look to your bookmark designs. The template design is neatly crafted in PSD format and features pleasant typography and reliable and specialized color palette. Although there are many free products available on the market, the truth of the matter is that these premium templates are guaranteed to give you many more great options to work with and therefore deliver great value for your investment. The template text is 100% editable and therefore you can put down your favorite words on your bookmarks. You can take advantage of this option to write personalized messages on the bookmarks as a way of communicating something special to the person you intend to give them to. Additionally, you can also write inspiring messages for yourself to keep you motivated every time you are reading your books and marking the last page you read. You can use our handcrafted Sleeklens templates to make dozens of artistic masterpieces for use on different days or seasons depending on your mood. These great products come with clear instructions on how to install and use them. In addition to this, they are simple and very easy to use. Also included in the PSD file, there are different font names and clipping masks. The clipping masks are ideal for creating unique looking typography and custom photo layouts in Photoshop. Each of these files will turn out to be a great product to add to your collection of authentic and resourceful items. A contemporary themed template that fits any kind of photograph to use! Up to three photos can be used, which certainly will craft a lifelong memory for those who use it. 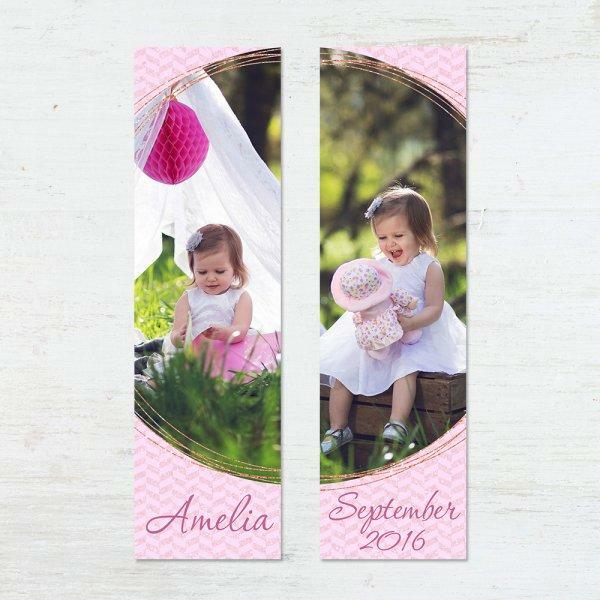 Is there any better gift for a book lover than a bookmark with pictures of your daughter/niece or granddaughter? Give joy to your beloved ones with this lovely pink-themed handcrafted design! 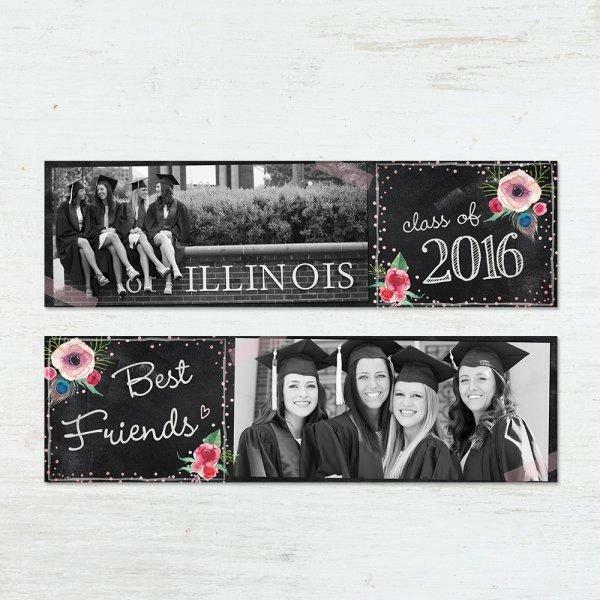 Cute, but yet enough professional looking for crafting the perfect Graduation Day souvenir for your family and friends. Feel inspired by a delicate monochromatic scheme and petite flowers to express the joy of one of the most important days in your life. Spring is coming and so does your creative flair! Lovely, floral inspired designs to help you create an everlasting memory; plus some refreshing watercolor textures, in cute pastel tones, to frame your entire composition. Looking for a practical souvenir for your wedding day? No need to look anywhere else and enjoy this handcrafted design by our artists – fresh, inspiring bookmarks to customize with your perfect wedding photo.